Uttarachal now known as Uttarakhand is a state in the Northern part of India, its often referred to ' Land of the Gods' coz of many holy Hindu temples and pilgrimge centres found in the state.It borders the Tibet Autonomous Region on the north, the Mahakali Zone of the Far-Western Region, Nepal on the east and the Indian states of Uttar Pradesh to the south and Himachal Pradesh to the northwest. The state is divided into two divisions, Garhwal and Kumaon, with a total of 13 districts. The beautiful state of Uttarakhand has a very simple, yet delicious cuisine. The food is nutritious as well as tasty. The primary food of Uttarakhand includes vegetables.Uttaranchal food is highly influenced by the topographical and lifestyle of the people. The culture of the people can be found extravagantly in their festive food, that will further the Uttarakhand charm in your holidays. People of Uttarakhand are fond of both vegetarian a well as non vegetarian. The characteristic feature of Uttarakhand food lies the sparing use of milk and milk products. This is due to the fact that in Uttarakhand the hilly cows do not yield good quantity of milk. Rice is the staple food of the people, but the favorites are the lentils. The most famous dish in Uttarakhand is bhatt (a variety of soya bean) and the rust brown horsegram also called kulath. Among other lentils delight are large dried balls of urad dal, called badis and their smaller version prepared from moong dal called mangodi. These delights are consumed mostly during the winter seasons.One of the common culinary delight of Uttaranchal comprise Mandua (Buck wheat), which is a coarse grain with high fibre content. The use of tomato in Uttaranchal cuisine is minimal and food is essentially cooked in mustard oil or pure ghee. Very interestingly, Hash seeds, locally known as Bhanga are used as spices.Some of the main items on the menu list in Uttaranchal cuisine are Singal, Gahat ki Dal(horsegram dal), Rus(black soyabeans dish), Aloo ke Gutke (spiced boiled potatoes), Kumaoni Raita, Jhangora Ki Kheer, Sani hui Muli and Nimbu(radish and lemon with spices), Kafuli(Spinach dish), Arsa, Gulgula and Kulath Phanu etc..Aloo Ke gukte, i picked this dsih as its one among the main items of this cuisine, this is a famous snacks which is prepared with boiled potatoes. Its quite often prepared in road side shops in the hills. Boil the potatoes with enough water, peel the potatoes and cut as small pieces. Heat oil, fry the dry red chillies, remove and keep aside. Fry the cumin seeds and add turmeric powder. Add the cubed potatoes,cook for few minutes, add the spice powder,salt. Cook in simmer until the potatoes gets well coated with the spices. These potatoes are quite similar to the sindhi aaloo that we make..except for the red chilli. .surely these are really yum. Very similar to the Marathi batata bhaji. Love it. simple and tasty potato roast... who would say no to potatoes.. ?!! Simple and delicious dish, perfectly done.. Potato roast looks very delicious Priya. Happy to see you trying many regional as well as International cuisines. Keep rocking ! simple & yummy aloo roast!! 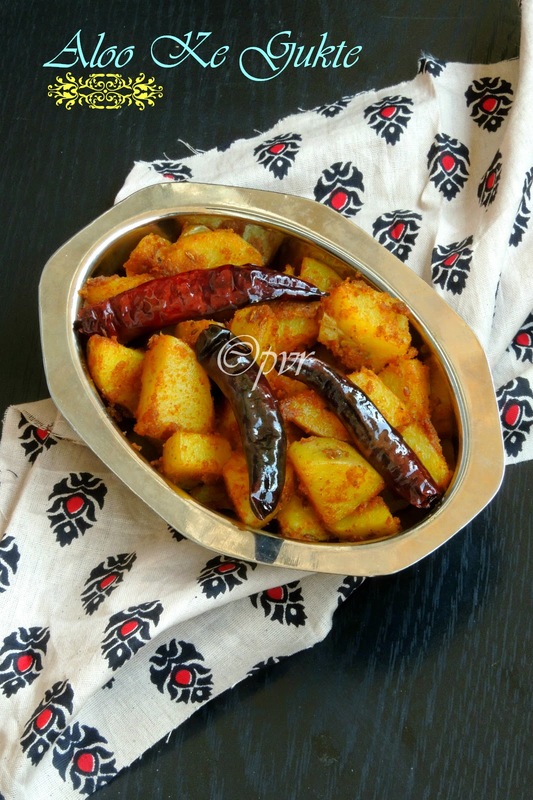 Often make this potato dish but never knew it was Uttarakhand cuisine! Thanks for all the info. Luks so spicy n hot.goes well vth hot rice. Same like our potato pakoda......looks tasty! any thing with potatoes is always good. Such a simple and delicious potato curry. My husband would love this. Another Aloo!..well I guess all aloos tastes great..very simple and looks so good Priya...good one.. Simple and yummy looking potato fry,sounds interesting and inviting.. Even I made these gutke. I like the way your turned out. You aloo looks crisp. Yum! The aloo gukte looks awesome and is very flavourful. It goes in my kids lunch box.